*I don’t mean to degrade the California Clasico set for the Bay Area Saturday as the struggling San Jose Earthquakes host the similarly suddenly struggling Galaxy at Stanford Stadium, but when a San Francisco-based newspaper needs the validation of an English newspaper to put a state rivalry in context, my guess it is not the “most intense rivalry in American soccer.” (These media types have apparently not been to Seattle or Portland of late). *Also, this newly-signed ‘Quake isn’t available for the contest, but could be for the Chivas USA game next month against San Jose. *Wondering what’s going on these days with the Palos Verdes Peninsula’s oft-injured John Thorrington at struggling D.C. United? You guessed it. *One player not on the roster who probably should be is former Galaxy striker Mike Magee, the leading MLS goalscorer who can’t stop popping balls in the back of the net now he’s with the Chicago Fire. He now has seven goals in seven Fire games. *Galaxy midfielder Robbie Riogers, who grew up in Rolling Hills Estates, had this reaction to two landmark U.S. Supreme Court rulings Wednesday regarding marriage equality. *Inglewood’s Jose Villarreal and the U.S. Under-20 team were bounced out of the Under-20 World Cup today, losing 4-1 to previously winless Ghana. *Meanwhile, Chivas USA is also facing the loss of a key player for an extended period of time. Bowled over? Only hapless Chivas USA in the latest installment Sunday of the SuperClasico it seems (Photo by Staff Photographer Michael Owen Baker). Rumor central update: A Spanish sports daily claims relegated La Liga team Mallorca has publicly acknowledged and rejected a Galaxy offer for a certain Mexican star. I don’t think I can recall a less anticipated SuperClasico than the one scheduled for 8 o’clock tonight in Carson, for reasons MLS beat writer Phil Collin recounts in today’s game preview. Of course, this is more than two teams going through an increasingly long poor patch of form. The hosts of today’s game are more a car wreck than a soccer team, as Phil Collin observes in a lengthy feature piece today that sums up what must be a candidate for one of the most poorly run American sports organizations of all time. In one respect, the article lets MLS off easy when they clearly must shoulder a great deal of the blame for allowing this debacle to go on as long as it has, exhibiting zero leadership and allowing the league and sport to become a laughing stock in one of the nation’s largest soccer markets. It is, frankly, little short of disgraceful. Incidentally, I thought this rather clueless article from MLS’ propoganda arm summed up Chivas USA almost insurmountable issues. Hire Steve Sampson? Make a signing that will raise eyebrows? Get their own stadium? My, my, those are novel ideas. Given that Chivas USA are in a class by themselves when it comes weird moves (Eric Avila, a player not even a regular in MLS before he signed for Chivas USA is Liga MX material with CD Guadalajara, really?) more are really not needed (just ask Juan Agudelo). And getting owner Jorge Vergara to actually invest in the future of a clearly flailing and failing franchise is not only unlikely to occur, but is far too late at this stage to rescue a team with no identity and few fans anyway. 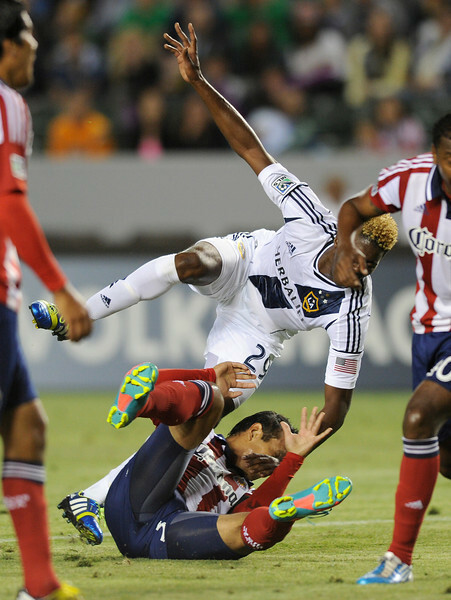 Chivas USA are on borrowed time, even while the powers that be don’t seem to accept or grasp that simple concept. And on that note, enjoy the game. 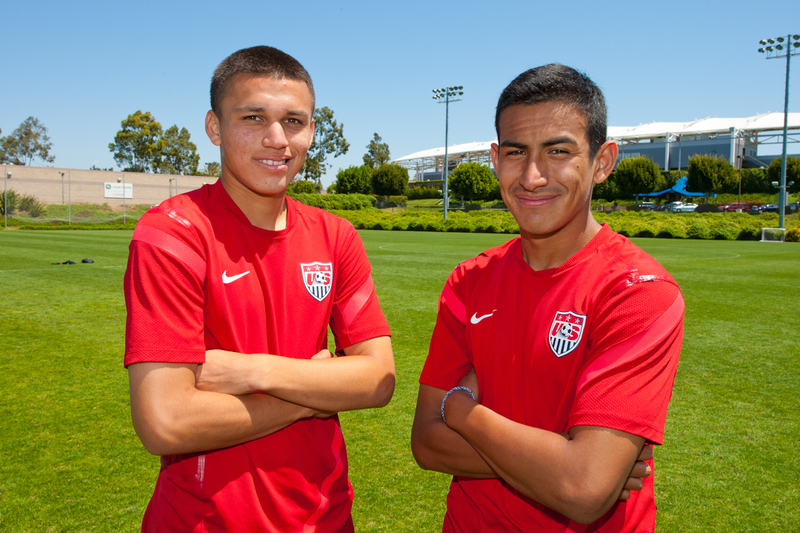 Galaxy players Oscar Sorto of Los Angeles and Jose Villarreal of Inglewood are among the Southern California contingent on the U.S. U-20 World Cup roster that opens today (Photo courtesy LA Galaxy/German Alegria). More on the opening match against World Cup favorites Spain (who have taken an early 1-0 lead) currently under way on ESPN 2 is here. Check out Hermosa Beach resident Abby Wambach’s historic achievement. Having sat through the Galaxy’s largely flat and uninteresting 0-0 draw with the Portland Timbers Wednesday in Carson it’s perhaps best, if you must know more, to read the account by staff writer Phil Collin and skip the video lowlights. Not so coincidentally no one had much interesting to say afterward either, coach Bruce Arena conducting a post-game press conference all of two minutes long. I asked him what his team had discussed in the locker room after the game about their (largely invisible) offense. He said they hadn’t really talked about it. I asked him to elaborate and he said he couldn’t because, well, they hadn’t talked about it. Seemed reasonable based on the game. One of those games when you look forward more to the beer afterward than a substantive post-game discussion, frankly, or find more than a degree of empathy with this sort of lawsuit (why are soccer fans forced to subsidize the Dodgers and Lakers anyway)? Let’s hope Passback Pete hides that game video from the kids in the Academy. And not much of an ad for the upcoming less than SuperClasico lately against host Chivas USA at the rather late hour of 8 p.m. on Sunday. Will it be a stinker of a game…? A busy day for Southern California soccer fans no matter what team or nation you support. It wasn’t a vintage performance by the U.S. men Tuesday night, but it was enough to see off Honduras, solidify the American position atop the group and all but qualify for the World Cup. Coach Jurgen Klinsmann may have said it best in this game story from sister newspaper The Salt Lake City Tribune: “The big picture is that we are growing,” he said. Quite. The faltering Galaxy meet the surging Portland Timbers as StubHub Center makes its official game debut tonight and the visitors are eying first place in the Western Conference. Meanwhile, last place Chivas USA have scuttled all the way to Canada for its first game under yet another new coach with the Vancouver Whitecaps promising to #kicksomechivas tonight. The Vancouver perspective is here. Brazil-Mexico kicked off at 11:30 a.m. on ESPN in the Confederations Cup. Tickets went on sale this morning for the Guinness International Cup at Dodger Stadium. The Under-20 World Cup begins Friday under tight security. Julio Chavez, captain of a Chivas USA youth team and a Modesto resident, died in a car crash in the city over the weekend. Read more on the U.S.-Honduras game in Salt Lake City tonight and Landon Donovan’s views on what Pablo Mastroeni will bring to the Galaxy here.